Halo settings are ever so popular. And versatile too! 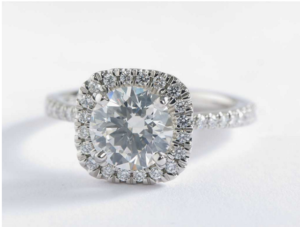 Take a look at this top-selling James Allen Pav&eacute halo setting for a cushion cut diamond and see how shoppers have customized this setting to their tastes. 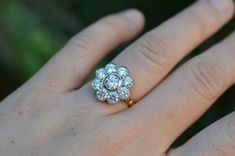 Even better, buy this setting before February 14th and save 15% during James Allen’s site-wide jewelry sale. Click here to shop the sale now. James Allen is known for their custom halo settings. 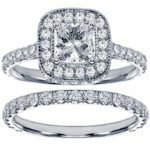 Unlike other online jewelers who will pop your selected stone into their pre-made setting, James Allen customizes your setting exactly to the dimensions of your selected diamond. 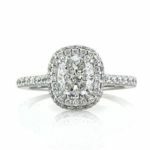 This results in a custom engagement ring with no awkward spaces or gaps between setting and center diamond. Whether you select a round, cushion or asscher-cut diamond, James Allen will craft a custom setting to fit it perfectly for a custom look engagement ring. 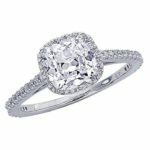 When you click through to the product page for this James Allen halo engagement ring setting you will see the option to select your metal type. From classic platinum and white gold to opulent yellow gold and the increasingly popular rose gold option. Need to control you costs? Pick 14kt white or yellow gold. Want a mid-range setting? 18kt gold options are the way to go. The most expensive option, platinum, is a strong metal which is sought after for its strength and beauty. This shopper on the right picked a yellow gold setting with a 0.74 ct center cushion cut diamond for a classic, stunning look. Love the warmth of yellow gold? 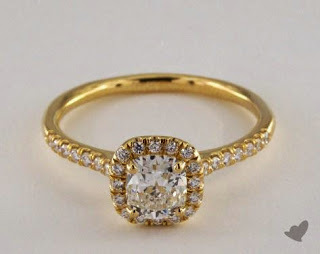 This setting captures it in an 18kt yellow gold option. Want to mix things up and create an engagement ring worthy of a celebrity? 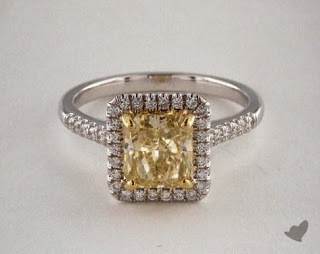 Yellow diamonds are exotic and rare, a great way to create a stand out engagement ring. The customer whose ring is pictured, left, selected a radiant cut 1.86 ct yellow diamond from James Allen’s extensive collection of yellow and fancy color stones. 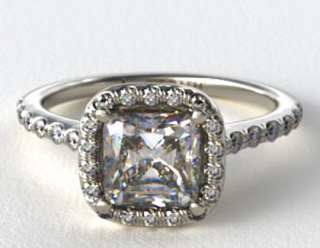 Notice how perfectly James Allen’s skilled artisans crafted the halo to fit this diamond? Exquisite! 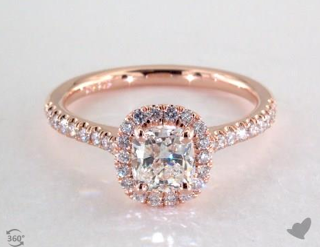 The number 1 most searched engagement ring term right now is “Rose Gold”. The soaring popularity of rose gold is reflected in many recent celebrity engagement rings, including Lauren Conrad, Blake Lively, and Bachelorette Desiree Hartsock. Why is rose gold so popular? The resurgence of rose gold in the fashion world – rose gold buttons and zippers have been popping up on clothes and accessories everywhere – paved the way for this classic metal to make a comeback. 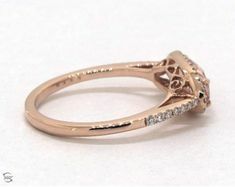 The romantic warm glow rose gold creates appeals to many. But maybe the reasons are more practical. A rose gold setting is more forgiving with a diamond in the K color grade. Rose gold’s warmth complements the slight color variations in a K color diamond in a way white gold can not. 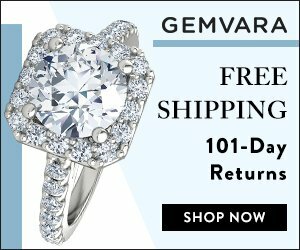 Picking a K color diamond allows you to get a larger size diamond than you can afford in the colorless D-J range. 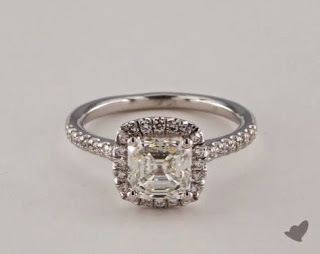 Want to customize this setting with an Asscher cut diamond? You can. 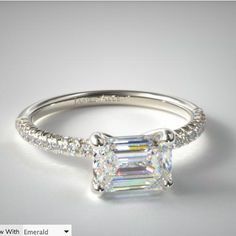 Because James Allen creates each setting for your selected diamond, they can accommodate an Asscher diamond beautifully. 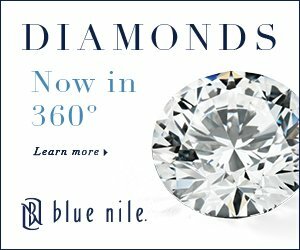 Not like other jewelers who will plop your selected diamond into a pre-made setting. Corner prongs hold your Asscher diamond securely in place in this custom pave setting. 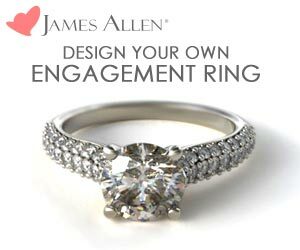 Pick a matching pave wedding band for a perfect match with your James Allen Pave halo engagement ring. 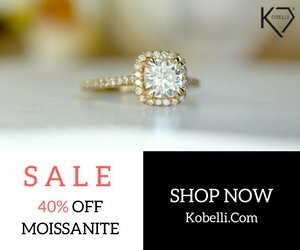 Click here to see the matching wedding band, and save 15% off both wedding ring and engagement ring setting until February 14th! 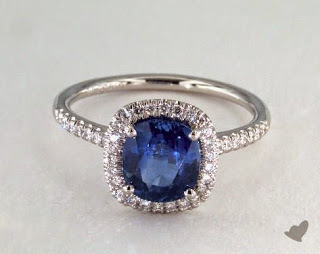 Sapphires are said to represent loyalty, and are often used as an alternative to diamonds in engagement rings. The most popular sapphire engagement ring was the one Prince Charles gave to Princess Diana, and is now worn by Princess Kate Middleton. Create your own family heirloom by customizing a platinum engagement ring setting like this one with a colored gemstone at James Allen right now.